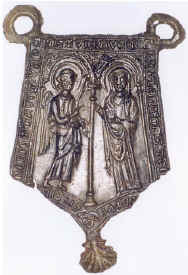 Religious pewter badge from Aachen, so called 'mirror badge'. The central circle originally contained a mirror. The bottom circle shows a seated Mary with child, flanked by two angels who are holding the 'Tunica'. Two suspension loops on each side. The top part shows a 'Vera icon', flanked by two towers. This pewter badge will be delivered in an innovative display case. The badge will remain completely visible as it will 'float' between two transparant flexible silicone membranes. The membranes will protect the badge while it can be safely removed at any time. The practice of putting mirrors in badges started in the first part of the 15th century. In the Middle Ages it was believed that pilgrim badges that had been in contact with a relic provided protection against danger or sickness. Some very popular shrines attracted too many pilgrims, so they could only allow the pilgrims to venerate the shrine from a distance. It was believed that the sacred protection could be received with the help of mirrors. This practice is most known from Aachen badges, but it was followed by other popular shrines ('s Hertogenbosch). The 'Vera icon' is the true image of Christ, as printed on the handkerchief of St. Veronica. Every seven years, the Aachen Cathedral follows a custom which began in 1349. The relics of Mary are taken out of the shrine and are put on display during the Great Aachen Pilgrimage. The Shrine of St. Mary contains St. Mary's cloak (Tunica), Christ's swaddling clothes, St. John the Baptist's beheading cloth and Christ's loincloth. During the Middle Ages it was customary for pilgrims to bring back proof of their pilgrimage. As proof of their voyage to a particular shrine they returned with a badge, usually made of lead or pewter. 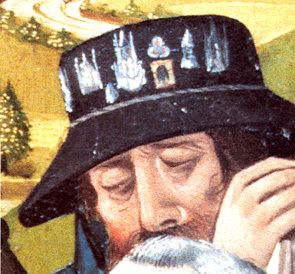 Most pilgrim badges show some figure or device, identifying it with the name or place of pilgrimage. Common shrines were at Santiago de Compostella (Spain), Canterbury (England), Cologne and Aachen (Germany) and of course Rome and Jerusalem. When pilgrims returned, they proudly wore these badges fastened to their hat or cape. Examples can still be seen in some Medieval stained glass windows, drawings or paintings. As well as being 'proof' of having made a pilgrimage (early souvenir), they also attached special value to the badge. Pilgrims believed that a badge that had touched a certain relic would offer protection against danger or sickness, or offer assistance that was needed (conception, childbirth, etc). The reason for a pilgrimage could vary from a punishment or doing penance to a special thanks or praying for help from a Saint.